Seasonal winter treats somehow seem incomplete unless they are imbued with a frosty, peppermint flavor. This is easily accomplished by enhancing the recipe with peppermint oil or peppermint extract, cultivated from the leaves of the peppermint plant. This plant’s scientific name is Mentha x piperita, the “x” indicating that it is a hybrid mint, formed by crossing watermint (Mentha aquatica) and spearmint (Mentha spicata). As a hybrid plant, peppermint is sterile, unable to produce seeds. Instead, it reproduces via rhizomes, bulbous plant masses found underground that are very similar to ginger and turmeric roots. Like many rhizomes, peppermint rhizomes can be planted almost anywhere, growing quickly once sprouted. 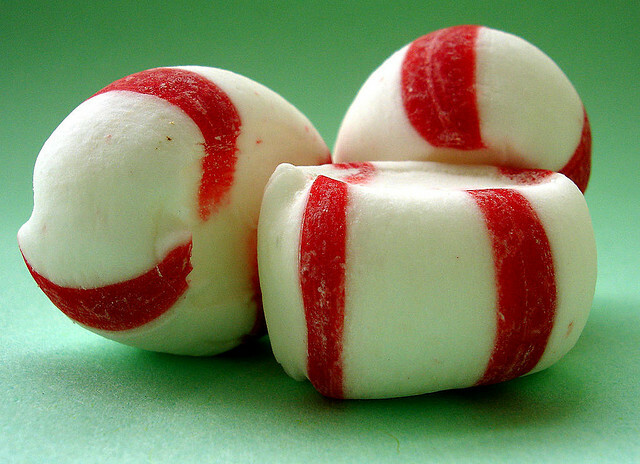 For this reason, the peppermint plant is listed as invasive in Australia, the Galapagos Islands, New Zealand, and the Great Lakes region of the U.S. .
Peppermint oils and extracts get their characteristic Christmas-in-your-mouth flavor from their two main constituents, menthol and menthone. Of the two, menthol may be the more recognizable: When ingested, applied topically, or inhaled, menthol triggers cold-response sensory receptors, which cause that familiar cooling sensation . You may have experienced this from chewing minty gums, using toothpaste, or applying Bengay to sore muscles. 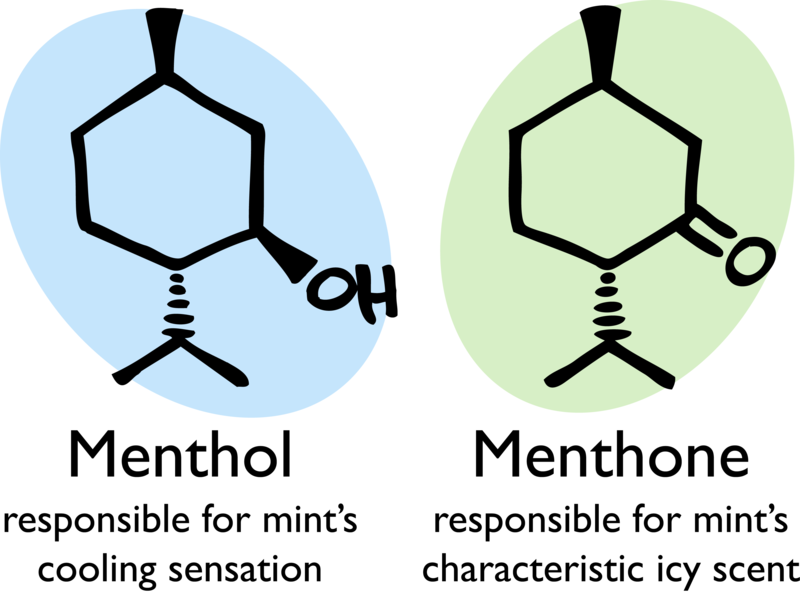 Menthone is structurally related to menthol, but it affects a different sense in peppermint-flavored treats. This molecule gives rise to the icy, minty scent reminiscent of evergreen winters. Its distinctive fragrant property makes it popular in perfumes, cosmetics, and scented oils. If you indulge in something peppermint this month, take some time to appreciate the menthol and menthone that makes this essence a holiday classic. Feel the sharp chill in your mouth while you bask in the warmth of a heated room. Take in the scent of cool mint while the winter wind outside whirls away. ‘Tis the season. Pacific Island Ecosystems at Risk: Mentha x piperita <http://www.hear.org/pier/species/mentha_x_piperita.htm>. Knowlton, Wendy M., et al. “A Sensory-Labeled Line For Cold: TRPM8-Expressing Sensory Neurons Define The Cellular Basis For Cold, Cold Pain, And Cooling-Mediated Analgesia.” Journal Of Neuroscience 33.7 (2013): 2837-2848. Academic Search Complete. Web. 23 Nov. 2013. There are times when gourmet edges more towards the laboratory than the kitchen; spherification is one of those times. In this culinary technique, liquids are transformed into globular semisolid gels thanks to a hydrocolloid gum extracted from seaweed. 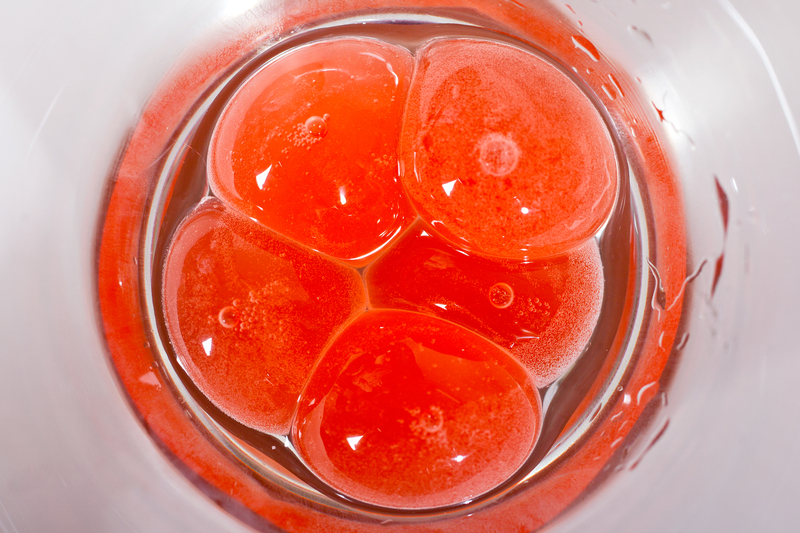 When these gel-encased balls are broken, the liquid contents gush out, akin to biting down on mochi or a Gushers candy. In theory, almost any liquid can be spherified, so the possibilities are endless. Ever wanted to eat plum juice caviar, spherical crème brûlée, or mojito spheres? With food-grade sodium alginate, calcium solution, and some creativity, it’s possible. At the Spherification Potluck last month, graduate students Liz Roth-Johnson and Kendra Nyberg delved into the process on the molecular level. Gelation is made possible through the interaction between alginate and calcium ions. Alginate is a long, negatively charged, noodle-like molecule. When mixed into a liquid, alginate floats about freely, its elongated structure creating a thick, jelly-like consistency. Calcium ions are single calcium atoms with two positive charges, enabling each ion to link together two alginate molecules. Many calcium-linked alginate molecules gives rise to a more solid structure—the gel skin that encases a gooey center. Liz (left) and Kendra (right) explain the nuts and bolts of spherification. 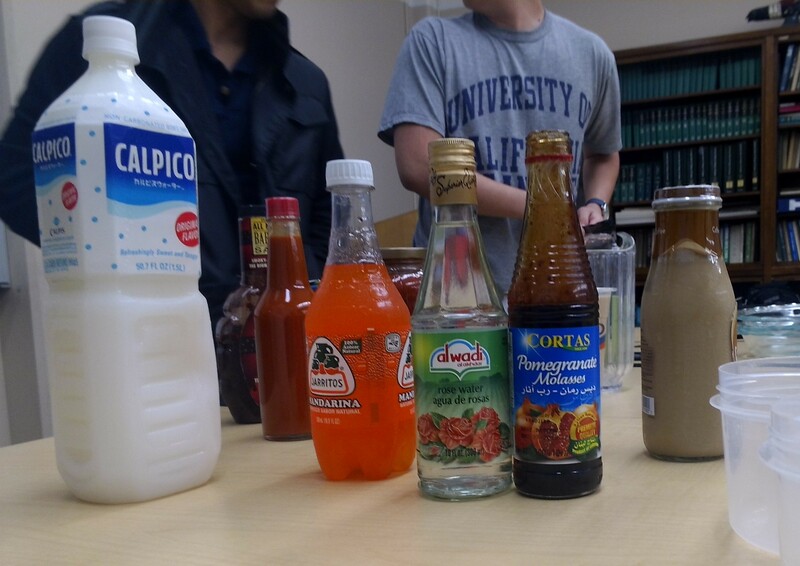 Students brought a variety of beverages, sauces, and condiments to the potluck. 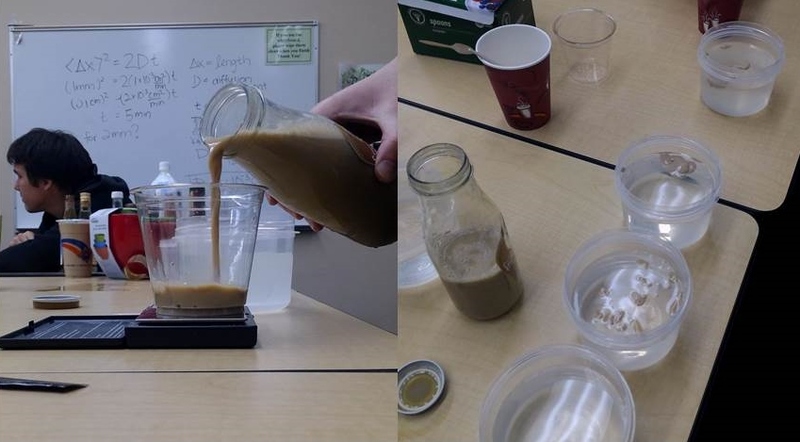 Attendees at the student event opted for items found in kitchen pantries and grocery store shelves, such as pomegranate molasses, rose water, coffee drinks, milk tea, sodas, guava nectar, and hot sauce. In the first attempt at spherification, coffee was mixed with the sodium alginate to produce a rather thick goop. Plopping globs of this dense solution into the calcium chloride baths gave comical results, as the mixture adamantly refused to form any shape remotely resembling a sphere. Some blobs even broke upon removal from the calcium chloride baths. Milk tea and Jarritos orange soda gave the best results in terms of shape and stability. Initially, the center of the milk tea spheres was thicker than expected, yielding a much chewier texture than bargained for. Minimizing incubation time in the calcium chloride solution managed to fix this halfway, somewhat decreasing the thickness of the gel casing. A quick search also revealed that our recipe used twice the sodium alginate other spherification recipes called for. If less alginate was added to the milk tea or orange soda, the spheres would have definitely been gooier. 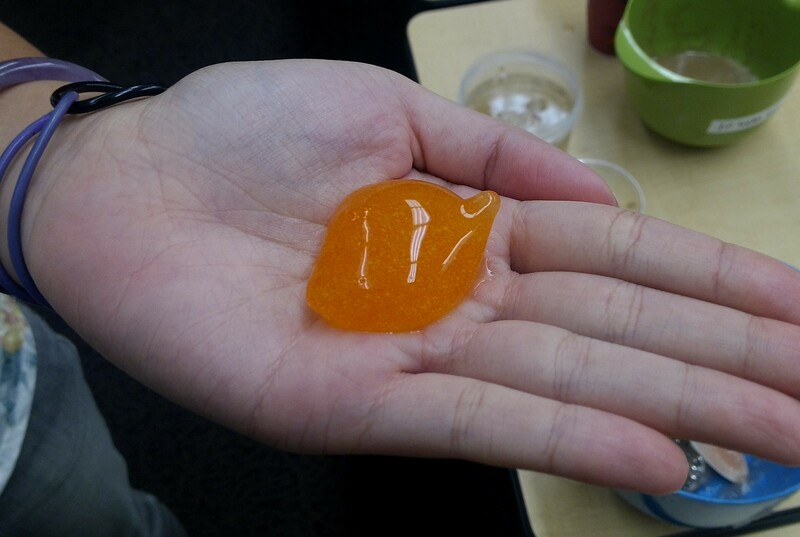 A student shows off a fairly successful attempt at spherified orange soda. The most difficult to work with was Tapatio, and not just because of the spicy fumes that emanated from the mixing bowl. Hot sauce is acidic, meaning it is full of positively charged hydrogen ions. Mixing it with alginate neutralizes the negative charges, hampering the interaction between alginate and calcium. No alginate-calcium interaction, no cross-link formation, no gel. Dropping the Tapatio-alginate mixture into calcium chloride resulted in nothing more than dissolved Tapatio swirling around in solution. Spherification encompasses a high degree of flexibility. Besides the gamut of foods that can be used, there are also technical alterations—the ratio of liquid to sodium alginate in the pre-sphere goop; the concentration of the calcium chloride solution; the amount of time the spheres are left sitting in the calcium solution. And this is only the direct method. Other variations on this technique include reverse and frozen reverse spherification. With spherification kits readily available online, why not try spherifying your own recipe? Share your spherification adventures with us in the comments below! Why Do We Bother to Eat Bitter? Through exploration of the ancestral context of taste, scientists can better understand how modern humans use the sense of taste to make decisions and survive. Evolution has shaped our sense of taste to guide us to seek the food we need to survive, while steering clear of foods harmful to us. It is understandable that early humans who avoided spoiled meat and poisonous berries were able to pass down their genes, giving modern humans the ability to avoid them too. But what explains the countless humans who voluntarily consume, and even enjoy, some bitter foods? Why do we eat bitter greens? Brussels sprouts? Hoppy beers? Why do we tolerate some bitter flavors and not others? Tastes can be positively or negatively palatable depending upon their context among other food flavors. Sour fruit flavors like grapefruit or cranberry can be refreshing and delicious to eat, but sour milk clearly signals that the food has expired. 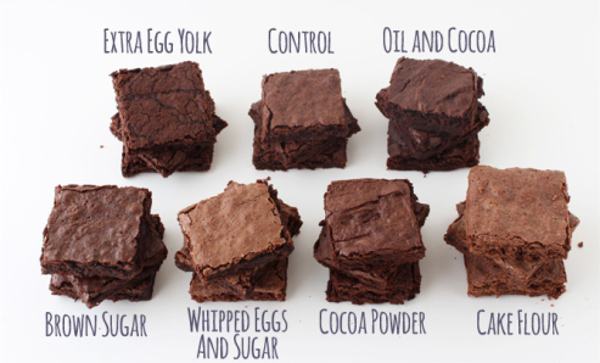 These matches between tastes and flavors are called flavor congruencies. Most taste-odor flavor pairings are learned associatively through eating. Flavors associated with calories and nutrients become more pleasurable with time, whereas poisoning and illness teach us to associate foods with an unpleasant taste or disgust. For omnivores like us, learning the consequences of eating different foods is an indispensable survival tool. Because our range of food option is so vast, it is essential to sample many foods and connect their post-ingestive consequences with their perceived tastes. Bitter-tasting substances are innately disliked by infants and children presumably because most bitter compounds are toxic. Most children are drawn to all things sickeningly sweet, but as adults enjoy eating eat bitter Brussels sprouts. We learn to enjoy the taste of mildly bitter foods, especially when paired with positive metabolic and pharmacological outcomes. The more your body benefits from an ingested food, the more palatable it becomes . Our bodies require phytonutrients such as flavonoids that cannot be physically separated from their vegetable carriers. Humans learn to tolerate low levels of bitterness in foods as they co-occur with nutrients in plants through a post-digestive reward/punishment system. For example, rhubarb contains 0.5% oxalic acid by weight, a substance that in large doses can cause joint pain and fatal kidney stones. The first time a child eats rhubarb, the initial taste response tells the brain that the food is bitter, toxic, and should be avoided. However, as the body begins to benefit from the essential nutrients in rhubarb without suffering any damage, the rhubarb becomes more and more palatable. Experiments show that rats can very quickly learn associations between tastes and metabolic and physiological consequences, perhaps in a matter of days. These associations occur after only a single trial and are strong enough to resist fading away even after multiple presentations of the food with no physiological consequences . In humans, a large sugar molecule called maltooligosaccharide (MOS) presents a sweeter case of taste association. Human saliva transforms starch into MOS. Although MOS is tasteless, it activates brain reward centers in a manner similar to sugar, while non-nutritive sweeteners do not. Thus, a tasteless molecule that has positive metabolic outcomes can activate brain reward areas more effectively than a sweet-tasting substance that has little nutritional value . The next time you eat mustard greens, stop to appreciate the complex process that allows you to taste and enjoy your leafy meal. Consider how your perception of taste has evolved, which has protected your ancestors from poisoning themselves. Reflect upon the incredible and complex mechanisms humans have developed to keep you well nourished. 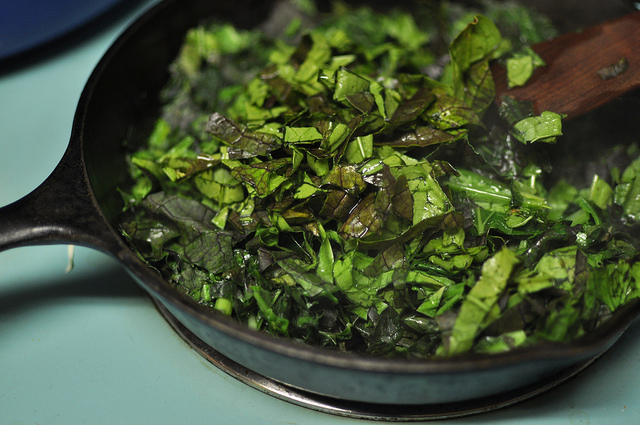 And if you still haven’t warmed up to greens, consider introducing them gradually into your diet. By exploiting the body’s associative adaptation to taste, you could learn to love them. https://sites.lifesci.ucla.edu/ibp-scienceandfoodnew/wp-content/uploads/sites/123/2013/12/bittergreens_melissamcclellan.jpg 425 640 Grant Alkin https://sites.lifesci.ucla.edu/ibp-scienceandfoodnew/wp-content/uploads/sites/123/2016/09/newlogoSm-2-300x31.png Grant Alkin2013-12-03 10:00:442013-12-03 10:00:44Why Do We Bother to Eat Bitter?